the geordie times online (newcastle united archive fanzine): "IT'S A CARVE UP!" "WE'VE WON THE PAY DAY LOTTERY!" "VILLA! VILLA! HERE WE COME!" 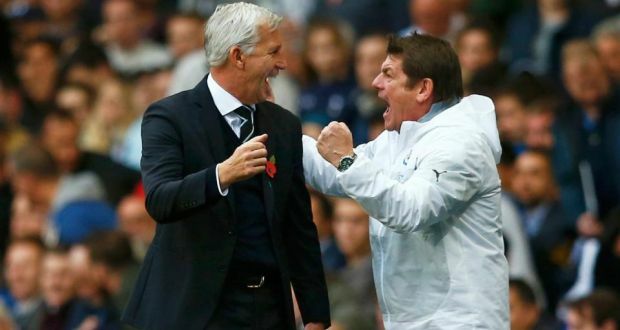 Havin 'guided' WBA to one win in 18 games with a 5.6% win record the 'dysastrous duo' of Pardew and Carver have finally been shown the door after 9 straight defeats, which see's the west midlands club on the brink of relegation! NUFC played them away in the new year when we drew 1-1! Tony Pulis had been given 'the bullet' when they were ootside the bottom 3, just before we played them! Rumour had it that Pardew and Carver would take ower on the followin' Munday and we warned their fan at the nearby train station after the match, that this would be a disastrous appointment after they both 'guided' us to relegation in 2015-2016! They both will of course get a massive severence pay day for failure, but yoo can rest assured that they will torn up somewhere else and "Hoy a spanner in the works!"